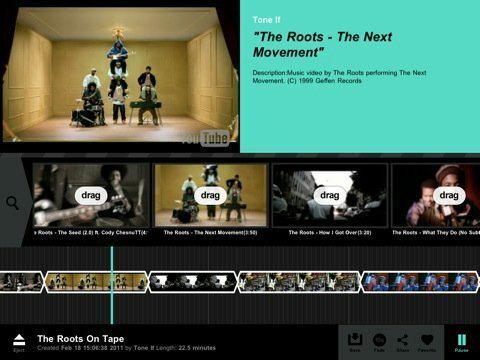 There’s a new app for the Apple ipad that’s recently been released called Dragontape and this new application allows Apple iPad users to create “mixtapes” of online video clips and songs, so lets you compile all your favourite video clips into one mixtape. According to the guys over on Ubergizmo, the Dragontape app allows the user to edit, cut, and fade areas of the file so you can get a smooth transition between edited videos and create a mixtape of the best parts. The Dragontape iOS app has YouTube and SoundCloud integration, the ability to share favourite tapes on Twitter and Facebook, the ability to bookmark tapes by placing them in a personal collection, crossfade playback SoundCloud tracks, and simple to use interface. Dragontape for the Apple iPad is currently in beta and is available as a free download for the time being from iTunes, and just so you can see what it’s all about we have a demo video courtesy of Dragontape below for your viewing pleasure…enjoy.